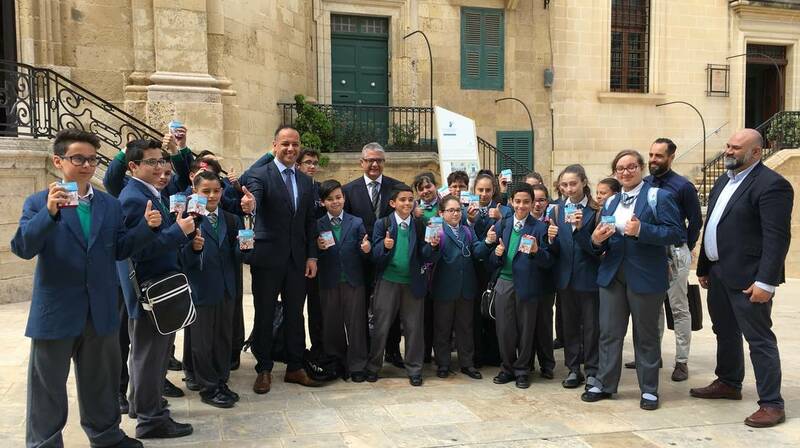 The Discover Valletta packs were distributed this morning to a group of Form 1 students from St Ignatius Middle School in Ħandaq. A group of Form 1 students from St Ignatius Middle School in Ħandaq met in Pjazza de Valette on Monday. 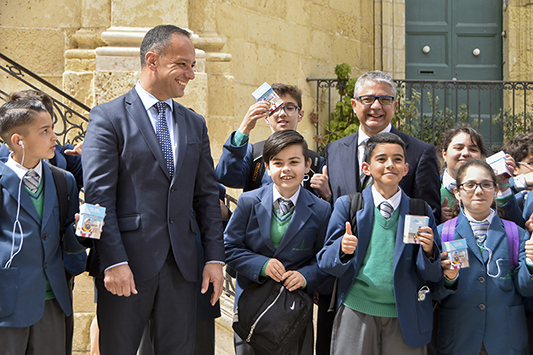 Accompanied by their teachers, they were welcomed by Jason Micallef, Chairperson of the Valletta 2018 Foundation and Charles Azzopardi, Executive PR & Marketing at Bank of Valletta. The initiative was linked to the Discover Valletta packs which are this year marking their 4th anniversary. Jason Micallef, Chairman of the Valletta 2018 Foundation along with a group of students from the St Ignatius Middle School in Ħandaq this morning. Discover Valletta is a series of short stories, narrated by Trevor Zahra, linked to twenty-four landmarks in the capital city. The narratives are available in audio-format through an MP3, but the pack also includes dedicated flash cards for every location and a map of Valletta. This year over 4,000 packs have been distributed to Form 1 students across 45 different schools in Malta and Gozo. This brings the number of packs distributed to date to over 18,000. Welcoming the students, Mr Micallef explained, “This project literally brings education and culture together in a fun learning experience. The MP3 players enable the children to rediscover the European Capital City of Culture by listening to narratives of the people from different social strata who lived in Valletta at different times during our rich past.” He explained that the fact that Form 1 students are being provided with the pack, means that the students can use it both with their teachers, “as a class event, like the one we are enjoying today, as well as a family outing, since they get to keep the pack.” Jason Micallef thanked Bank of Valletta for its collaboration on this project as well as for taking up the role of preferred partner of the Foundation and supporting its efforts during this year when Valletta is the European Capital of Culture. The students went on to visit various landmarks including Pjazza Teatru Rjal, Knisja tal-Vitorja and Auberge de Castille.